Cut pile: Still one of today's most popular constructions, cut pile achieves its durability through the type of fiber used, density of tufts and the amount of twist in the yarn. Highly twisted yarn will hold its shape longer, making it a smart choice for high-traffic areas. Textured Plush — Most decoratively versatile. Textured surfaces help hide footprints and vacuum marks. Add causal beauty to any room. Preferred style for busy households. A great “whole-house” carpet. Saxony — Refined surface. Works well with traditional interiors. Ideal for living and dining rooms. Friezé — Forms a "curly" textured surface because yarns are extremely twisted. Has an informal look. Helps minimize footprints and vacuum marks. Plush (Velvet) — Has a dense luxurious feel. Shows footprints and vacuum marks easily. Best for low traffic areas and formal rooms. Level loop pile: Here loops are the same height, creating an informal look. This style generally lasts a long time in high-traffic areas. Many of today’s popular Berber styles are level loop styles with flecks of a darker color on a lighter background. This is a good choice for contemporary to cottage furnishings. Multi-level loop pile: This style usually has two to three different loop heights to create pattern effects, providing good durability and a more casual look. Cut-loop pile: This carpet style combines cut and looped yarns. It provides variety of surface textures, including sculptured effects of squares, chevrons and swirls. The multicolor effects hide soil and stains. Fiber selection affects carpet end use performance. Manufacturers are a valuable resource in determining the fiber and construction most appropriate to the application. These are the basic types of carpet pile fibers. 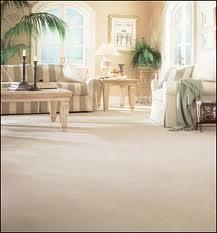 Nylon: Two types, Nylon 6,6 and Nylon 6, are typically used in carpet. Nylon features include the ability to produce a variety of color schemes, luxurious soft “hand”, excellent resiliency, durability, abrasion resistance and texture retention. Other features include good resistance to stains and soils. Nylon is considered to be suitable for all types of traffic. Solution dyed nylon provides excellent color fastness and increases stain cleanability. Olefin (polypropylene): Olefin features include its inherent and permanent resistance to water-based stains, its colorfastness and resistance to static electricity. Olefin is resistant to moisture, making it the primary fiber used in indoor/outdoor carpet. Polyester: Polyester features include its luxurious soft “hand’, inherent and permanent stain resistance, and ability to produce bright colors. Other features include good abrasion resistance, fade resistance, and cleanability. Triexta: Triexta features include its luxurious soft “hand”, excellent colorfastness and bright colors, inherent and permanent stain resistance. Other features include durability, resistance to fading, cleanability, texture retention and resiliency. Wool: Wool is a natural fiber noted for its luxury and performance. Its features include soft “hand”, high bulk, color variety and inherent flame retardant characteristics.